Flowers can be bold and colorful or soft and feminine. No matter how you choose to wear your blooms, there is no mistaking flower designs as one of the most alluring tattoo options. While flower tattoos work well on their own, they also work well paired with other images. This simple design places emphasis on the flowers by stringing them along a large scroll. One of the most popular places to get a flower tattoo is on the shoulder. This naturally curved area helps bring your blooms to life. While colorful flowers can make a powerful image, consider how lovely a gray scale flower tattoo would look. The image becomes softer, more intimate and decidedly more alluring. Make an impact with numerous flowers. These falling lotus blossoms are Japanese in style, and float easily down the back in a feminine flower slide. While multiple flowers can make a statement, sometimes a single bloom can be even more bold. Place a single flower away from other tattoos to get the biggest impact. Flower tattoos can be big and brusting with life, or they can be smaller. 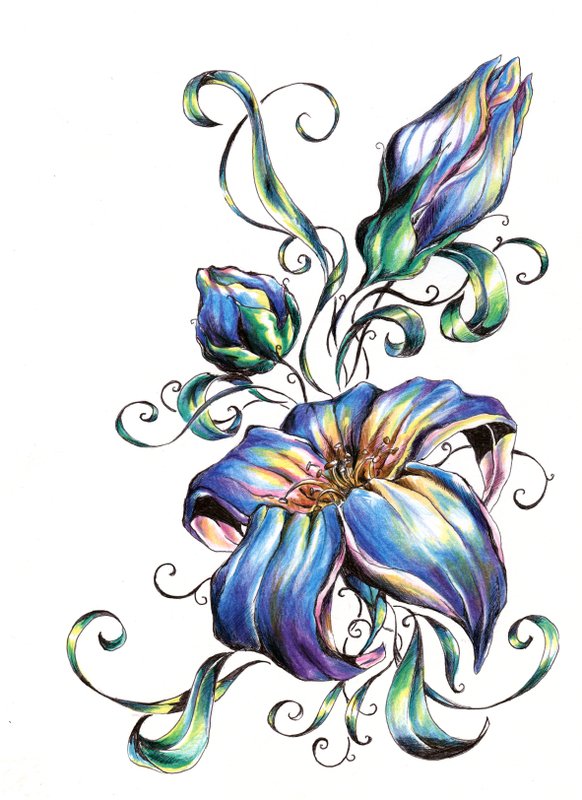 Try clustering several small blooms across a larger area for a delicate and feminine tattoo. Flower tattoos are worn primarily by women, but not exclusively. Men can wear flowers like red roses as a sign of romance, or as a memorial tattoo. Multiply the power of your flower tattoo by two by giving your tat a mirror image. Using two bold blooms instead of one can balance out the body and draw the eye evenly. Some tattoos work best in areas like the lower back if there is some symmetry involved. Rather than just sticking to an abstract image, though, add a flower bloom to the center to give it focus. Want to make the ultimate statement in flower tattoos? Consider creating a tattoo sleeve out of nothing but blooms. The riot of color, texture and pattern that is sure to result will be as eye-catching as it is beautiful. With so many options, you'll have a hard time narrowing down your selection to just one - or a few - flower tattoos.